Fiji is a nation made up of more than 330 islands; only one-third are inhabited. A British colony for 96 years. Fiji gained its independence in 1970. Fiji has a population of 902,335. The majority live on the two largest islands—Viti Levu and Vanua Levu. 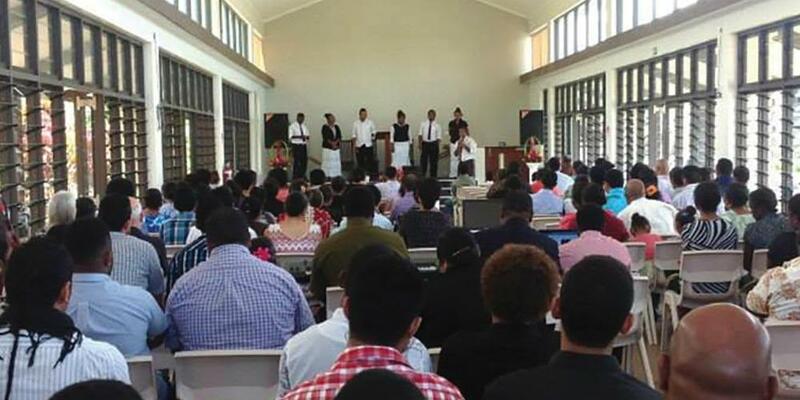 At the end of 2014, there were 24,732 Adventist members in Fiji. Fiji receives an average of 70 inches of rainfall each year. About half of the population is ethnic Fijian, and almost half are of Indian descent. The story thus far: When Pastor Joe Talemaitoga began his work as chaplain for Adventist young people in Suva, Fiji, he was told that his top priority was to establish a church/evangelistic center to serve the many students attending the University of the South Pacific and surrounding educational institutions. Through unusual circumstances, Pastor Joe quickly learned about an ideal property and met with the owner. When Pastor Joe contacted the financial board leaders, there were mixed feelings about purchasing the new property. “We’ve already decided and voted,” some said. Nevertheless, they all agreed to meet Pastor Joe at 1:00 that afternoon at 7 Grantham Road in the center of Suva, just two blocks from the University of the South Pacific. After much thought and discussion, it was decided to move ahead in purchasing the Grantham Road property. The For Sale sign was taken down less than 24 hours after it was posted because the Adventists now owned the property. Purchasing the property, however, was just the first of many hurdles the group would have to overcome before the Pacific Tertiary Evangelistic Center (PTEC) would become a reality. The next challenge was the building itself. The group soon realized that it would be better to construct a new building, rather than try to re-purpose the existing structure. That meant, however, that they would need to approach the city council in order to re-zone the property for a church building. When the group first presented their re-zoning application, the city council members were amazed. The next step in the re-zoning process was to get the approval of the neighbors surrounding the property. While all of the residential owners were happy for an Adventist church to come to their neighborhood, one owner was not pleased. The newly acquired Adventist land fronted property owned by the Roman Catholic Church. Determined to block all efforts to re-zone the Adventist property, the priest and nuns consistently refused to meet with Pastor Joe and the Adventist group for eight months. “No, we don’t want to negotiate; there’s no room for negotiation,” they repeatedly claimed before shutting the door. Nevertheless, the Adventists continuing praying and kept trying to visit the Catholic parish. The final needed signature was placed on the re-zoning request, and the city council approved the Adventists’ application. Eagerly Pastor Joe and his group moved forward, choosing an architectural plan featuring walls made of windows on either side of the new church known as the Pacific Tertiary Evangelistic Center (PTEC). “When people come out of the shopping mall and the cinemas, what will they see? We hope they will see Jesus. They’re going to get to see and hear about Him,” said Pastor Joe. Today, more than 300 university students worship at PTEC. Within easy walking distance from campus, the church has become a gathering place for faith-building and evangelistic activities during the week as well as on Sabbaths. This transparent church truly shines as a bright light for all to see. Visit the PTEC website at http://ptec.adventist.org.fj.